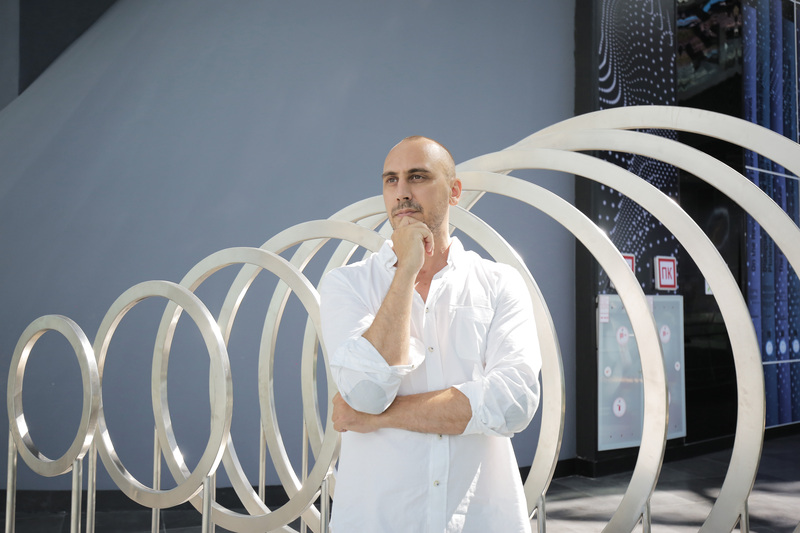 ASTANA – Contemporary French artist Mickael Obrenovitch created five amazing sculptures for the giant Nur Alem sphere at EXPO 2017. Many visitors saw the works, but few know the ideas and processes behind them. “My goal was to create accessible and attractive artwork that can talk to anyone simply with a relative abstract concept. At the expo, each floor had a different theme and each sculpture had to represent the theme. 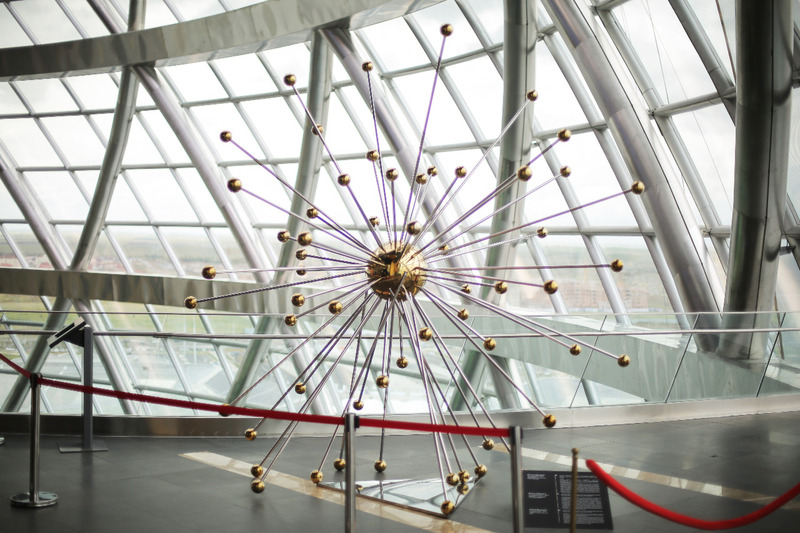 I designed each sculpture based on one word (solar energy, cosmos and others) that would talk and touch the public to understand the cause and defend it for the future generation,” said Obrenovitch in an interview with The Astana Times. Sunshine Power “symbolises the sun and the solar power it produces, like a fission of molecules from the centre which releases energy,” he noted. 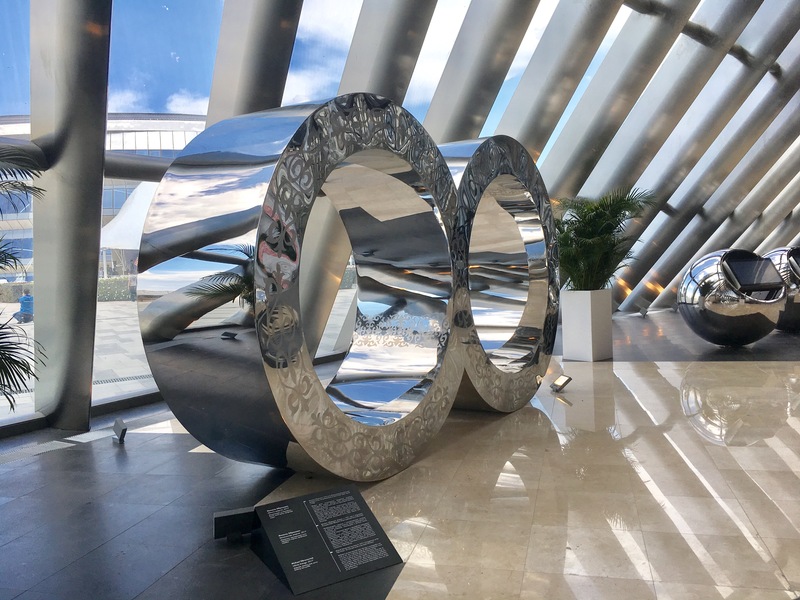 Infinity Energy, the large-scale infinity symbol, represents the unlimited potential of renewable energy and natural sources that can still be found on Earth and the universe. It is also his personal favourite for “the beauty of the shape, the size and meaning of this beautiful result,” he said. “Infinity is the word that defines my life line and spirit and you can find it in all my collections as well,” he added. Solar Wall seeks to show the importance of solar energy for the future as inspired by nature. It is an evolution to protect and live in symbiosis with the environment, noted Obrenovitch. The Kinetic Vortex art installation is a metaphor of the cosmos. “It appears to be a tunnel, but depending on your position it can have a vortex effect,” he said. 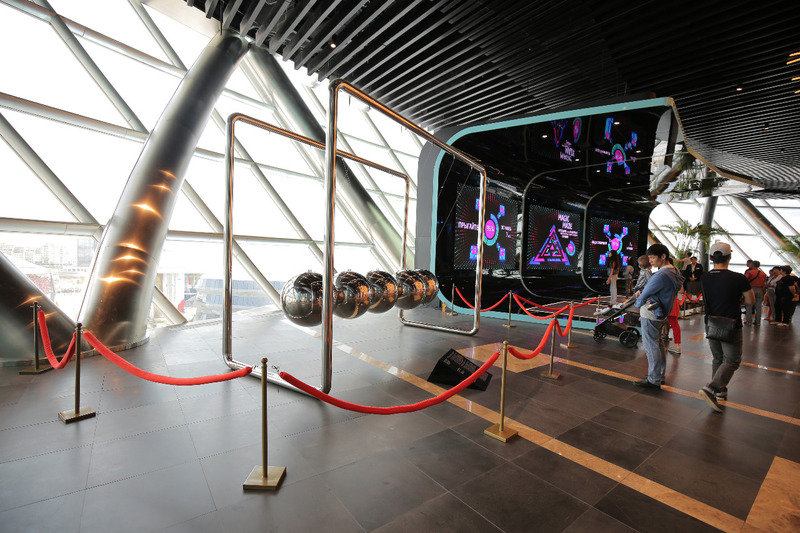 Newton’s Cradle, a reference to perpetual motion, shows guests how kinetic energy works and the way human action or movement can cause a chain reaction in the environment. All the works are made of stainless steel. The materials were chosen based on quality, durability and in conjunction with the splendid architecture of the capital, he said. The design took about a month, followed by five months of production and installation. “I’m very lucky and grateful for the professional work by the Kazakh factories. It could not have happened without them for sure. Solar Wall was made in Pavlodar and the others in Almaty. I’m grateful for the work they accomplished and passion they put into it. Each sculpture may look minimalistic, but it’s a very technical challenge to design it. Infinity and Solar Wall were particularly complicated to make and I was very impressed by the skill used to find a solution with ingenuity. Transport and installation was another story, but with a happy ending, of course,” said Obrenovitch. The sphere will remain as a museum, meaning these and many other works of art will be available for future display. “I was very happy they decided to turn it into an expo heritage museum. It’s a brilliant idea, as it is still able to create awareness to the next generation about future energy. I hope the expo will be a turn and milestone to bring Kazakhstan to the hub of renewable energy and innovative sustainable development purposes,” he added. The artist was born in Carqueiranne, a seaside town on the French Riviera. “My passion for art and history was passed on to me as a child from my relatives, who would take me to see exhibitions. I decided to study applied art and design at a university. From there, I turned my passion into a career and am now a full-time artist. As I like to say – there are no limits to creativity, only the ones you impose on yourself,” he said. Obrenovitch began work last year on the international art project Gates of the World and presented the Gate of Kazakhstan portion to different institutes in the country. The expo curator so appreciated the work he asked the artist to create designs tailored to the exhibition’s future energy theme. The event became a wonderful chance to make his inaugural visit to the nation. “I like Kazakhstan a lot and travelled throughout the country experiencing firsthand its culture and people as well as learning about its fascinating history. It’s a point in the world where all neighbouring cultures harmoniously mix in one country. Nature is beautiful and wild and I was particularly impressed by the infinite steppe landscape on the road to Burabai,” said Obrenovitch, adding he was also enthralled by the architecture, culture and lifestyle in Almaty and the capital, nature in Burabai, authenticity of the Pavlodar people and the city itself. “I’d say to expect the unexpected and I look forward to discovering more of what it has to offer there soon,” he said. His personal digital art collection exhibition recently completed a showing at the Ritz Carlton Almaty and he is seeking a venue for another collection in production. “I was contacted by various Kazakh institutes to create an original sculpture which should start in March 2018. I would like to achieve what I originally planned to come here for in the first place, which is the Gate of Kazakhstan. I would love to present it directly to the Ministry of Culture and [President] Nursultan Nazarbayev, whom I didn’t have the chance to meet during the expo,” he said. “In terms of international projects, I am working on several collections, including gates for all countries in the world, and I am preparing a proposal for the universal expo in Dubai 2020. My best project is yet to come,” said Obrenovitch. More information is available at the artist’s website, www.obrenovitch.com, and Instagram account, @obrenovitch. ASTANA – The Manifesto of Values and Principles, presented Sept. 5 during the EXPO 2017 Future Energy Forum (FEF) at the capital’s Congress Centre, addresses global environmental issues and calls for action. 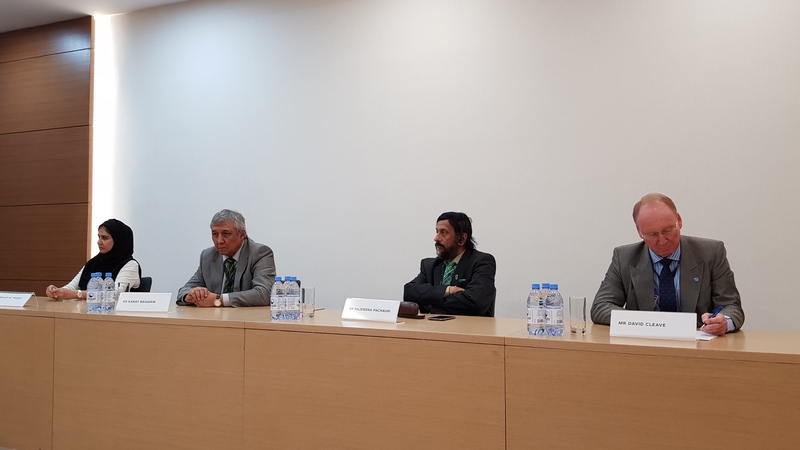 The manifesto is the concept combining project papers and proposals voiced during the exhibition, according to steering committee head Dr. Rajendra Pachauri. “The manifesto is the product of the group of experts who constitute the steering committee and the result of various conferences with fine speakers. Now, it’s our offering to the government of Kazakhstan and it is up to them whether to accept what’s been proposed by the manifesto,” he said during a press conference. Pachauri is the chief mentor of the Protect Our Planet Movement and president of the World Sustainable Development Forum. “The implementation, I think, will have to be done by the expo’s host country. It is to their glory and credit that there will be a legacy of the exhibition, so we expect that there will be an effort on the part of the leadership of this country to see that the legacy of the expo becomes a reality,” he added. The document is designed to tackle current global climate issues and help promote alternative energy across the world. It covers key global issues such as transformation to higher efficiency levels, transition to low carbon and zero carbon energy sources, energy for an urbanised world and a call for international cooperation. During the FEF, experts stressed 50 percent of Kazakhstan’s electricity supply will be generated by renewables by 2050. According to steering committee members, the manifesto’s project papers are aimed at becoming the road map to spread the most thought-provoking ideas and projects showcased during the expo. “The manifesto is the result of the brainstorm sessions that have taken place during the three months of the exhibition,” said Dr. Kanat Baigarin, vice president for innovation and research at Nazarbayev University and a member of the steering committee. The project papers include topics and proposals such as a global future energy institute, post-expo green fund for a sustainable future (a project of the Astana International Financial Centre), access to energy for all including off-grid solutions for rural areas, values and principles for a new GDP standard and solar power to Kazakhstan’s high-profile municipal buildings. 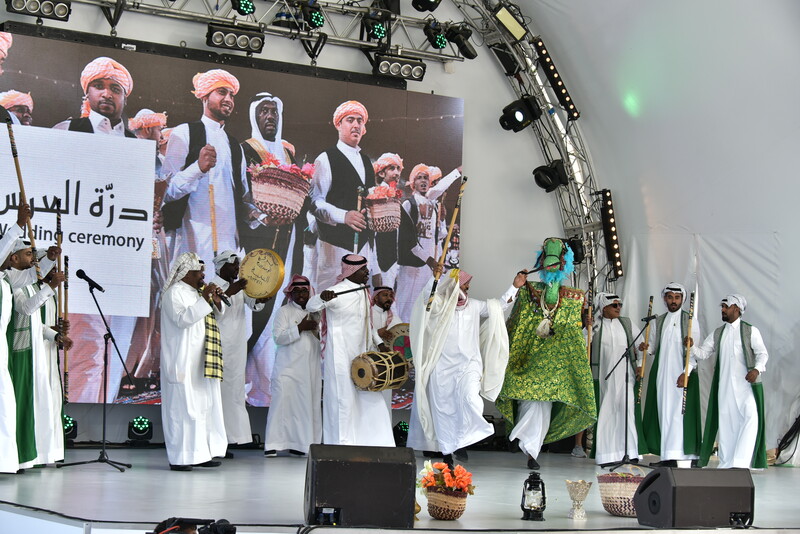 ASTANA – The Italian pavilion celebrated National Day at EXPO 2017 Sept. 4 with a performance by the Nello Salza Ensemble and the famous trumpeter for whom the group is named. The event opened by raising the flags and performing the national anthems of Italy and Kazakhstan. “Italy rightfully occupies an important place in the foreign policy of Kazakhstan, being one of the most active economic partners among European countries. This is evidenced by the presence of a number of large Italian companies and the dynamic development of trade and economic cooperation. I would like to note the fruitful work of the Kazakh-Italian intergovernmental working group on industrial economic cooperation, which strengthens the partnership relations between the two countries,” said Kazakh Vice Minister of National Economy Aibatyr Zhumagulov during the official part of the event. He noted trade between Kazakhstan and Italy for the first half of this year was $4.8 billion, a 39-percent increase compared to 2016. Italian Ministry of Economic Development Undersecretary Ivan Scalfarotto noted the expo will give impetus to developing his nation’s renewable energy sector in cooperation with other countries, including Kazakhstan. “Indeed, there is a great similarity between the themes of the exhibitions – EXPO Milan 2015 and EXPO Astana 2017. Both exhibitions call for finding difficult solutions to global problems, since the deficit, shortage of food and energy resources are always topical issues at any time for humanity. Therefore, for the future prosperity and for our generations, we must come up with new ways of solving difficult problems,” he said. The opening ceremony was followed by Salza performing with the capital’s Philharmonic Chamber Choir. He began his career as first trumpet of the San Carlo Theatre in Naples, then with the Opera Theatre in Rome. Salza has travelled to five continents with the Academy of Santa Cecilia Orchestra and soloists Andrea Bocelli, Jose Carreras, Placido Domingo and Katia Ricciarelli. Known as “The Trumpet of the Italian Cinema, Salza has performed popular scores in films such as “Once upon a Time in America” directed by Sergio Leone, “The Untouchables” by Brian De Palma, “The Legend of 1900” and “Cinema Paradiso” by Giuseppe Tornatore, “Life is Beautiful” by Roberto Benigni and the recent “The Hateful Eight” by Quentin Tarantino. The last featured the 2016 Oscar winning best original score by Ennio Morricone. 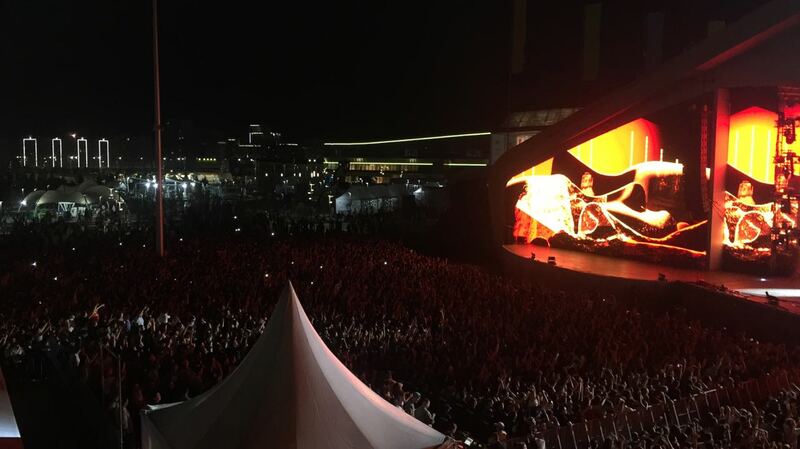 National Day is an important celebration, with more than 400 people visiting the venue, said Italian Pavilion General Manager Valentina Pomatico. She was pleased with the turnout. “We are happy, we are satisfied – I think we had big success,” she said. “Milano was an international exhibition, while the one is Astana is the specialised one in the middle between Milano and Dubai. The Kazakhstan one is strategic. Italy decided to participate in this. 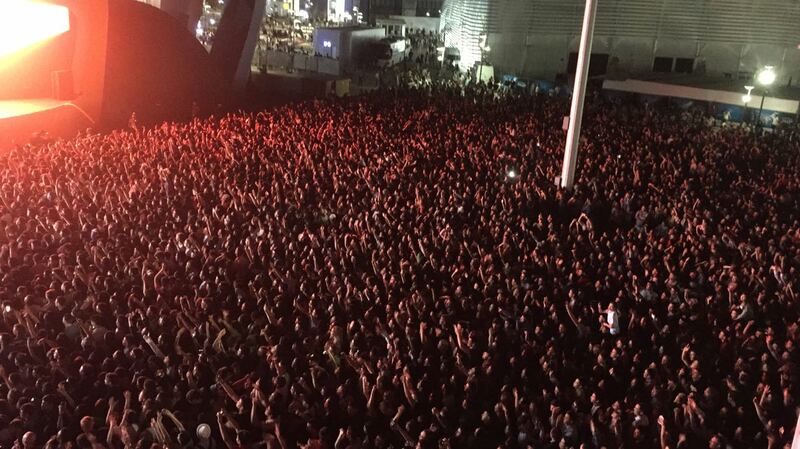 It is different from Milan, but I think it was very successful. The Kazakh side did a very good job,” she added. The pavilion features 15 of Italy’s 20 regions presenting relevant achievements in green energy and using the platform to develop business and cultural events, said Italian Ambassador to Kazakhstan and EXPO 2017 commissioner Stefano Ravagnan. The pavilion has also hosted important events in the space and transport industries. He noted the nation succeeded in finding prospects in green economy, as Italian company Bionet SRL signed a memorandum with Kazakh Invest in July to construct a plant in the capital. ASTANA – Kazakhstan’s major event, EXPO 2017, welcomed its three-millionth visitor on Aug. 25. He turned out to be a 38-year-old resident of Moscow, Yuri Shurygin. “I liked the Kazakhstan pavilion. Now I need to visit the Russian pavilion. Of course, we would like to see an event of such a scale to take place in the Ural region. There is a possibility of expo taking place in Yekaterinburg in 2025. We really hope it will happen,” said Shurygin on the day of his visit. At the same time, Chairperson of the Astana EXPO 2017 National Company Akhmetzhan Yessimov decided to personally congratulate him and present special gifts. Yessimov has also said that the number of people attending the expo is increasing every day. According to him, 15 percent of visitors are foreigners, most of them are from Russia. “One of the main aims of the exhibition was to increase the tourist flow into the country. We reached the projected mark. EXPO 2017 justified our expectations completely. The exhibition increased not only the number of jobs, but also increased incomes. Everyone felt the multiplication effect for small and medium-sized businesses. The hotels occupancy has doubled. The same dynamics can be observed with restaurants and public catering points of the city,” said Yessimov. 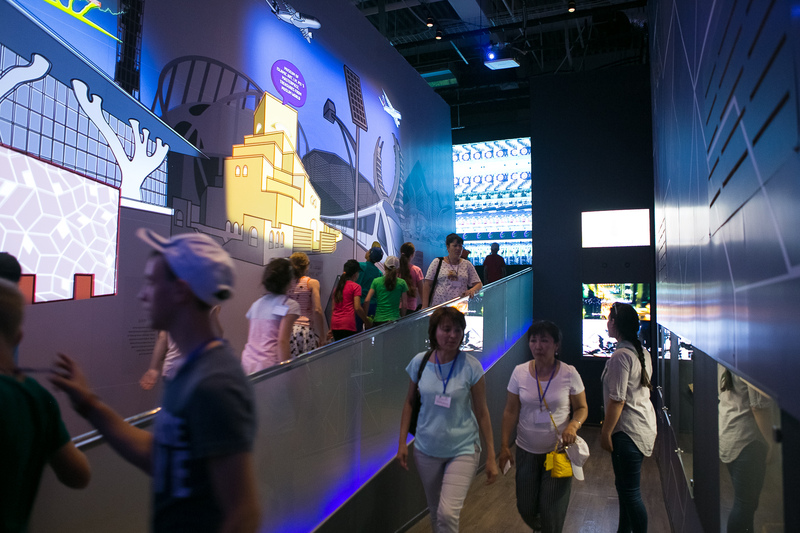 On Aug. 24, Kazakhstan’s national pavilion, Nur Alem, registered its one-millionth visitor. Earlier it was expected that during three months the exhibition will be visited by two million people. That goal was reached on Aug. 4. The lucky visitor was a 34-year-old businessman from Uralsk Gaisa Zhumaliyev. The future of the exhibition has become interesting object for many people. Yessimov has stated that President Nursultan Nazarbayev has approved the plan of post-exhibition use of its facilities. 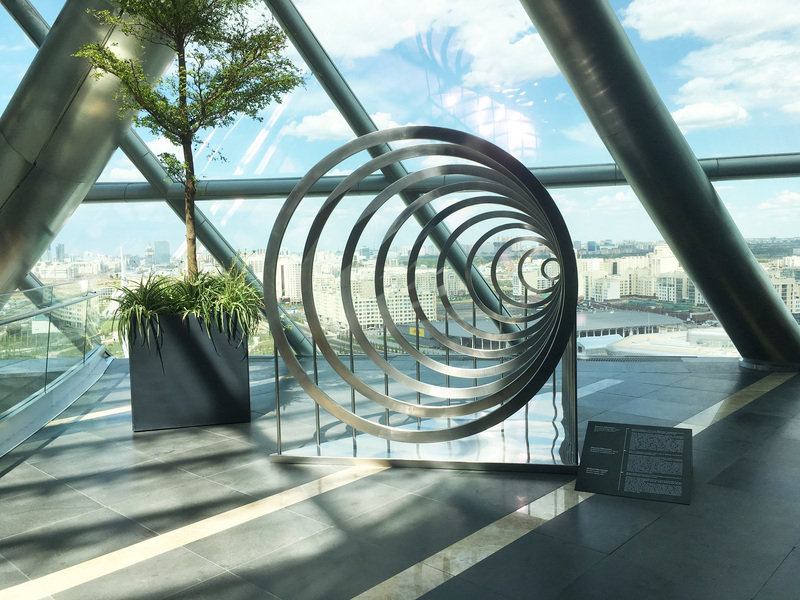 After Sept. 10, maintenance works will take place, after which the main facilities will start working again as three legacy projects are to take shape – the Astana International Financial Center (AIFC), the Future Energy international center for the transfer of green technologies and investment projects and the international IT start-up hub. ASTANA – The Italian region of Veneto brought its best energy solutions to the capital as part of Venetian week at EXPO 2017. The region’s scientists offered a unique experience in generating solar energy and producing energy from biofuel, including processed materials from vineyards, reported inform.kz. “Visitors and participants of the exhibition will witness the best achievements of the region that managed to fulfil the Energy Efficiency Directive’s tasks in a short period of time,” said regional Parliament President Roberto Chambetti, adding 40 percent of the region’s energy is produced from renewable sources. Venetian week also featured leading electricity and heat power companies, as well as electricity generation. The University of Padua Giorgio Levi Cases Centre on Economics and Technology for Energy opened Aug. 22 with a presentation on electrochemical energy storage systems. The project was designed to ensure the continuity of energy generated by photovoltaic and wind systems. The next day, the Italian pavilion hosted the region’s innovation, enterprises and starts-ups in energy. Regional start-ups and SMEs presented their technology and business partnership proposals, such as geo-batteries for thermal diffusion, built-in household batteries to store energy from renewable energy sources, electricity distribution systems and heating systems with heat recovery and energy recycling. The region’s innovative wine production systems were presented at the Identity, Innovation, Sustainability: the Energy of Conegliano Valdobbiadene Prosecco Superiore Docg seminar. A session on stationary and mobile storage for boosting renewable energy sources was held Aug. 24 to demonstrate scientific and technological innovation in energy storage. Italian scientists are convinced the accumulation of renewable energy sources is one of the main tasks related to the competitive use of environmentally-friendly energy sources for industry, logistics and transport and, in particular, electric mobility. Venetian days ended with the transfer of the Veneto symbol – vases styled from Murano glass – as a gift to the National Museum of Kazakhstan. They were exhibited during Venetian week at the Alessandro Volta hall in the centre of the pavilion. The Italian pavilion is among the largest at the expo. 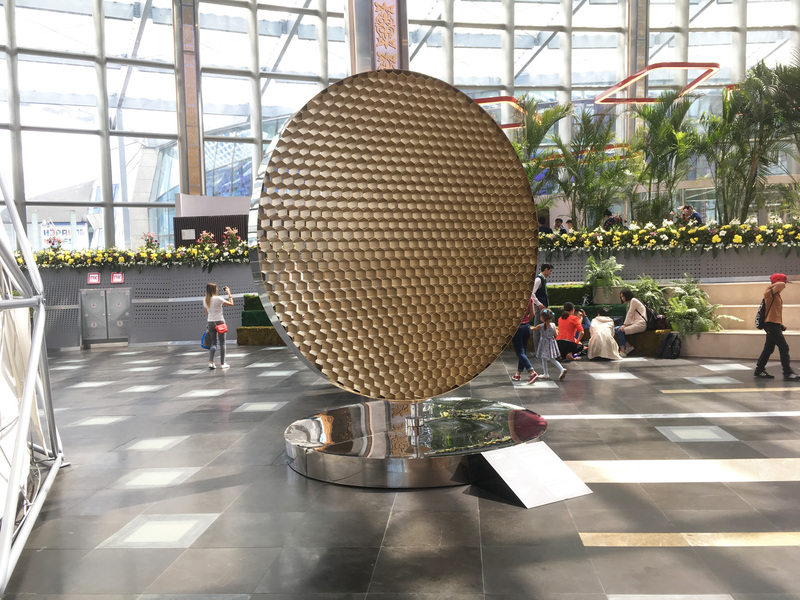 The building is divided into four oval areas, each dedicated to a particular theme and named after one of the Italian scientists who left his footprints in history. Video materials projecting on the pavilion’s high walls demonstrate the history of the nation’s energy development. The Veneto region’s official presentation with the participation of Italian Ambassador to Kazakhstan and its country’s expo commissioner Stefano Ravagnan was held Aug. 20. The ceremony featured a live performance by Rovigo Conservatory musicians Giovanni Angeleri and Cecilia Francini. ASTANA – The Qatari pavilion is hard to miss, for its glaring steel heads fidgeting in the wind attract the attention of many from afar. It is nearly impossible to pass without taking a picture. The nation of 2.8 million on the Arabian Peninsula is 235 times smaller than the size of Kazakhstan, yet it boasts some of the world’s largest natural gas and oil reserves. The pavilion is divided into three parts – past, present and future. Today, Qatar is the world’s top exporter of liquefied natural gas (LNG), with Japan and South Korea being the country’s largest importers. “The pavilion then tells the story of how we use the three energies, wind, solar and clean energy. We are building a stadium for the football 2022 World Cup using only solar energy and clean energy. We are also building two cities right now – Lusail city and Energy city. These two cities are being built with clean energy using only natural gas; there will be no pollution in these two cities,” said Al-Bloshi. 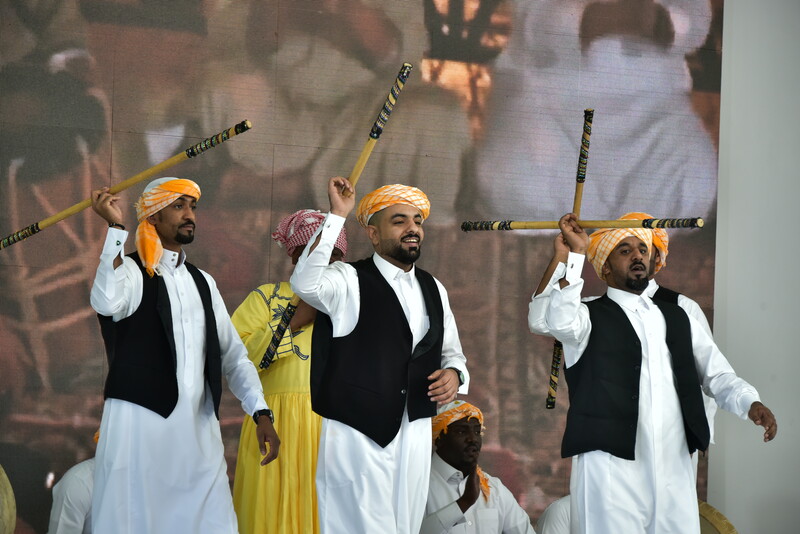 Al-Bloshi, who noted the visit wasn’t his first time in the capital, said there are many cultural commonalities between the countries. “There are many similar cultural things between Qatar and Kazakhstan. You have nomads and we have Bedouin people. You have a yurt and we have a Bedouin tent; it’s a different shape, but the idea is the same. You have berkutchis and we have falcon hunters; there are so many related cultural things including the musical instruments. I also like Astana; it is a clean and new city – like a part in Doha – the New Doha, it has more buildings made of glass,” he said. The Qatari pavilion hosts approximately 5,000 visitors on weekdays and up to 11,000 on weekends. At press time, approximately 450,000 guests had toured the pavilion since the beginning of the exhibition, said Al-Bloshi. “We are overwhelmed with emotions. When we heard ‘Insaai,’ we could not believe it. We looked at each other and then realised that it was us,” said team member Aigerim Sagyndykova. The top three apps also include Flash team with the QamCare app and the 3D Alippe app. Hackathon, which serves to promote children’s rights through innovation, was dedicated to the theme of urban solutions. The event, the third organised by UNICEF and International IT University, joined experts from the world of technological innovation and the science, private, non-governmental and public sectors in Kazakhstan and other countries. The participants had to offer innovative prototype solutions to the multiple, evolving challenges of urban children – ranging from tackling air pollution and improving safety to ensuring accessible transportation. The main ideas proposed were apps and games that aim to help children in disaster situations and tips on living in big cities. “We plan to continue to work with all the teams, not only with the finalists and winners. We welcome everyone in the UNICEF Innovation Laboratory, which is located in IT University. The laboratory is open to all; we provide opportunities that enable us to translate ideas into finished products,” said jury member and IT University Professor Beibut Amirgaliyev. “Around the world, innovations are making a difference in the lives of many, yet their potential to help the most vulnerable children and their families has yet to be realised. This hackathon encourages young people to use their skills for good, beyond just designing and creating innovations. As a result, we have some great prototype solutions benefiting children. We now also have a pool of young programmers willing to make a difference,” said UNICEF Deputy Representative in Kazakhstan Fiachra McAsey. 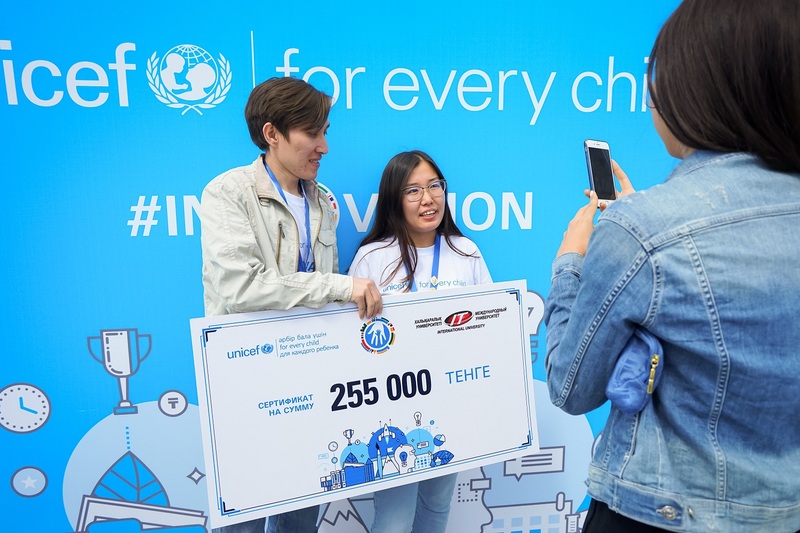 UNICEF earlier announced it would consider investing and developing in the best and most inventive prototypes either through UNICEF Innovation Lab in Almaty or the UNICEF Global Innovation Fund. UNICEF in Kazakhstan established the lab, hosted by International IT University in Almaty, in 2016. Innovation has always been at the heart of UNICEF’s work both globally and in Kazakhstan, according to UNICEF Representative in Kazakhstan Yuri Oksamitnyi. “Being innovative is not simply about using new technologies, but about working with new partners and trying new approaches to solving everyday problems. This is what we look forward to hearing at this unique meeting,” he added.